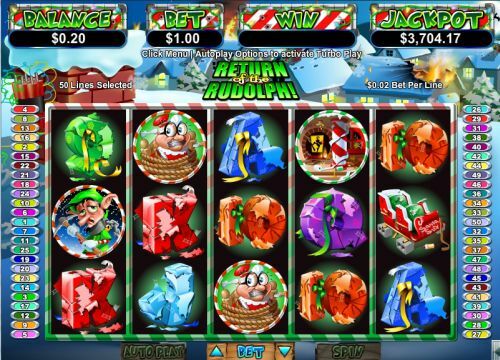 Return Of The Rudolph is a great Christmas themed video slot game that you can play and enjoy at Classy Coin Casino. This is a 5 reel, 50 line slot machine where you can wager $0.50, $1, $1.50, $2, $2.50, $3, $3.50, $4, $4.50, $5, $12.50, $25, $50, $125 and $250. You must bet at least $0.50 on Return of the Rudolph and the most you can wager is $250. Return of the Rudolph also features a progressive jackpot . This is a very easy game to pick up and play. And this Slot game uses Realtime Gaming software which runs and plays extremely well making for a better Slots experience. This game looks and sounds great and defiantly puts you in the Christmas Spirit thanks to the music and symbols. The game also features multipliers, three free spins, a bonus game and much more. Some of the Symbols used are; Rudolph (obviously), Santa, Elves, Mrs. Claus, Santa’s Workshop, Santa’s Sleigh and Reindeer thugs. You can play Return of the Rudolph for free by going to Classy Coin Casino. They give you the option to play using their browser based casino or they also have a downloadable casino. The downloadable version is much better and is our choice but the browser based is also decent. Once you download the casino your next step is to register at Classy Coin. After registering you are ready to play. First select the “Slots” option, then you‘ll see a 3 Reel, 5 Reel and Bonus choice listed above the games list. Return of the Rudolph is under the 5 Reel option and the games are listed alphabetically. Scroll down in the 5 reel games list to find Return of the Rudolph. Classy Coin Casino offers players a $25.00 no deposit bonus so be sure to take advantage of this offer. Nothing like playing slots at a Casino and getting to do it while using their money. Return of the Rudolph has an amazing set of betting limits. Players you can wager $0.50, $1, $1.50, $2, $2.50, $3, $3.50, $4, $4.50, $5, $12.50, $25, $50, $125 and $250 with the minimum bet being $0.50 and the maximum set at $250. This game also has a progressive jackpot available to be won. To win the Progressive Jackpot you will need to land 5 scattered thugs anywhere on the 5 reels. In addition to the progressive jackpot available on Return of the Rudolph there is also a bunch of other cool features. If you are able to land 3 or 4 of the scattered thug’s symbols you’ll then be able to choose one of the symbols to unlock 1 of 3 special features. The available features are: Santa Strikes back, where you are given 7 free spins where the some of the symbols have a candy cane in their background and by landing one with the candy cane in the background you;ll get a star. And by lighting all 5 stars your free spins go back to 7 and your multiplier increases. Another feature is the Rudolph’s Revenge. You also get 7 free spins for this and it’s during this game that you’ll be eligible to win the progressive jackpot. And the last of the special features you can unlock is the Rudolph’s Rampage bonus game. You will be taken to Santa Workshop that has been destroyed and you will be looking for his missing elves. The fewer amount of guesses it takes you to find the elves the more free spins you’ll receive . Return of the Rudolph also has an Autoplay mode that can be continued or stopped at any point during your playing session.. This Christmas themed slot is a great game that can and will be enjoyed at any time of the year. It has fantastic betting limits so all players will be able to enjoy this game from rookies to high rollers.